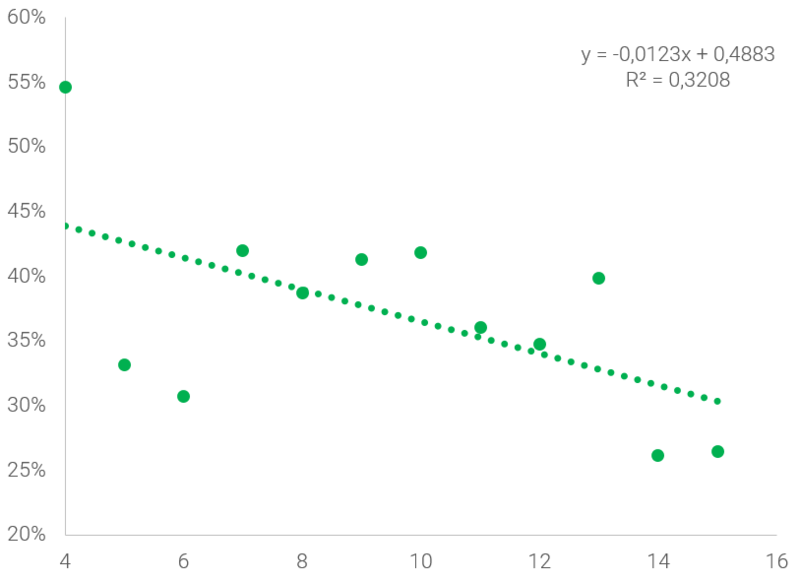 We have spend weeks analyzing price patterns of running shoes. First, you will be presented to an infographic with the most important conclusions. Secondly, we dig deeper into the numbers. Feel free to use content and graphics as long as you refer to this original source. For interviews, please reach out at jens@runrepeat.com or +45 29 29 29 58. 86% of all running shoes are available at a discounted price online. 56% of all running shoes are available at at 30% to 69% discount online. Best savings: Scott (62%), Reebok (53%) and Skechers (53%). Worst savings: Vibram FiveFingers (15%) and Topo Athletic (15%). Nike, Brooks, Asics and Adidas are discounted from 31% to 40%. 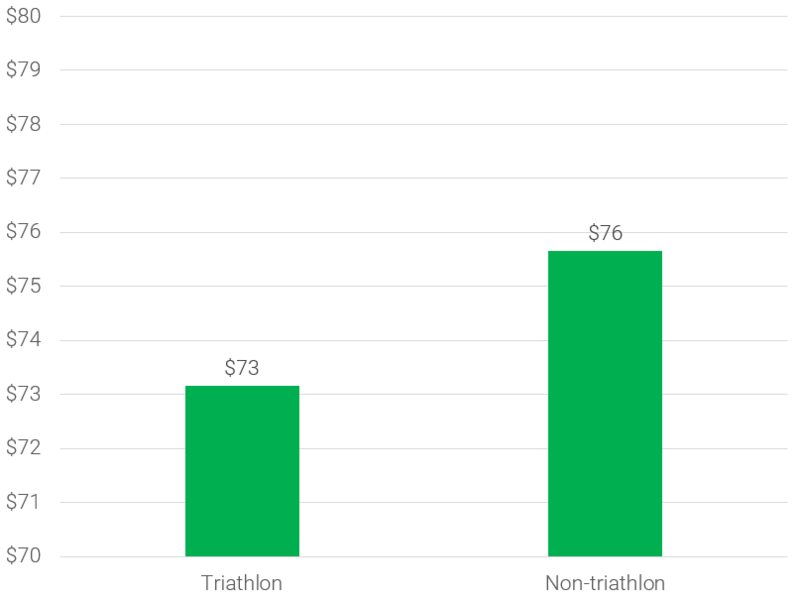 Multisport brands are discounted 12.95% more than running specific brands. The more arch support you request, the more expensive the running shoe is. Competition shoes are 17.01% ($13.22) cheaper than every day running shoes. The worse the reviews of a running shoe, the higher the discount. Running shoes are $5.60 more expensive for every ounce heavier it is. Best savings: Sierra Trading Post (41%), Amazon (34%) and Shoebacca (30%). Worst savings: Road Runner (1%), Denali Outdoor (1%) and Zappos (4%). Greatest selection: Amazon (2479), Road Runner (1320) and Zappos (915). Running shoe brands ensure high retail prices through cartel-alike price structures. Their contracts ensures that brick and mortar stores keep prices at the manufacturer's suggested retail prices (MSRP). If a store does not obey the dictating brands, they will shut down the partnership. Luckily to the consumer, prices on the internet are a bit harder to control. Looking at 450 current running shoes, we found an average MSRP of $121.10. For each shoe we found the cheapest option available across 41 online stores. The average price was $74.91. On average, you save 38.14% ($46.19) buying running shoes online. It's time consuming to scan 41 stores to find the best offer. Therefore, we created a price comparison on each running shoe. Deal hunters won't stop here. Every month new versions of existing running are introduced. Looking across our database of more than 130,000 user ratings, there seems to be little improvement from the old to the new versions. 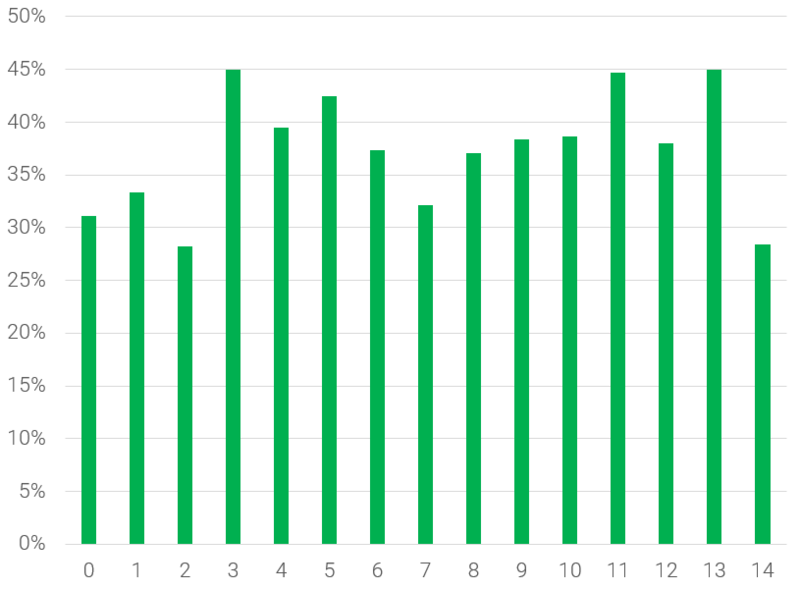 The average user ratings stays around the same average, indicating that runners are not more satisfied with new versions. Ask any brand about their new version of running shoe X, and they will most probably say something along the lines of: "It's lighter than ever, and the materials have improved significantly". But seriously, who would ask their barber whether they need a new haircut? Several brands have very clearly stated that they have "just created the best running shoe in history". In case there is a "one best running shoe", which we do not believe, one might ask: "if they're all the best, then which one is the best?". 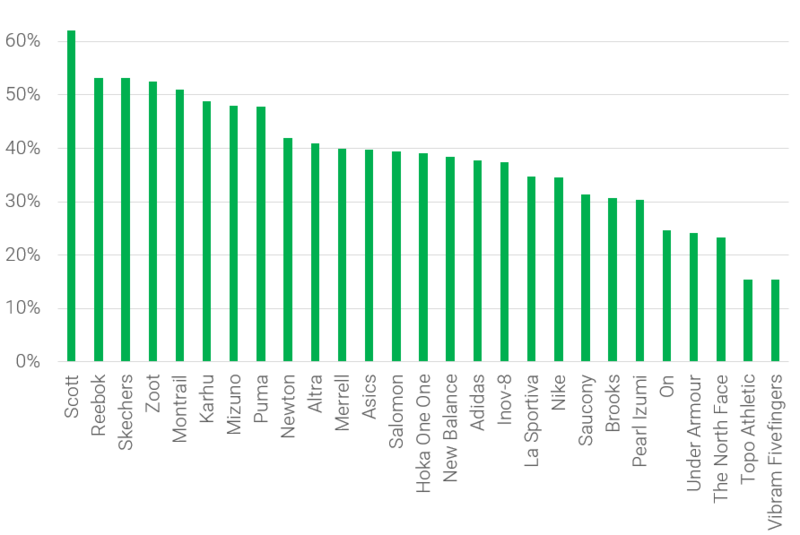 Brands obviously embrace their new coming running shoes, but truth is that most often runners are not more satisfied with new versions than the previous ones. If you're a true deal hunter, you might want to aim for last year's version, which on average saves you another 19.36% ($14.50). In total, buying last year's edition online compared to buying this year's edition in a brick and mortar store saves you an average of 50.11% ($60.69). One might expect that one a few selected current running shoes are discounted online, but in fact, 86% of all current model running shoes are available at a discounted price online. Only 14% of all current model running shoes are only available at MSRP. This even includes running shoes with an MSRP of $100 and a sales price of $99.34 (less than 1% discount). Further, the distribution shows that 56% of all current model running shoes are available at a discount between 30% and 69%. Only about one-third of all running shoes are available with less than a 30% discount. 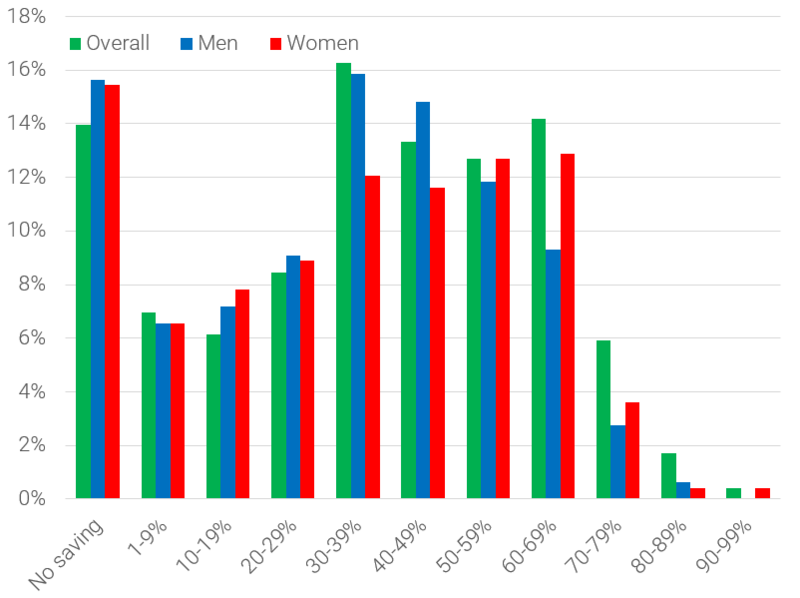 Overall the average discounts percentage is similar for men and women, though women have 22.41% more running shoes available at discounts of 50% of more than men. What brands are most discounted? Hoka One One is by far the most expensive brand if you were to buy at MSRP prices. Second is Newton followed by Salomon. Cheapest is Skechers. This aligns well with some of the findings in our previous study about cheap vs expensive running shoes. Brands or shoes like Brooks Adrenaline GTS 18, Adidas Pure Boost, or Asics DynaFlyte are somewhere in between. Looking at the actual buying price after discounts the most expensive brands are On ($105.4) followed by Vibram FiveFingers ($99.45) and The North Face ($95.41). 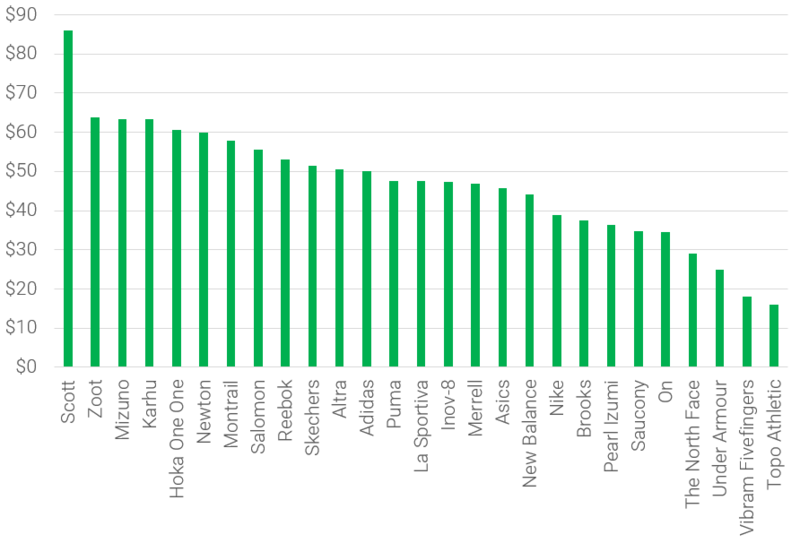 Of the major 4 brands, Brooks ($84.62) is most expensive and cheapest is Asics ($69.33). 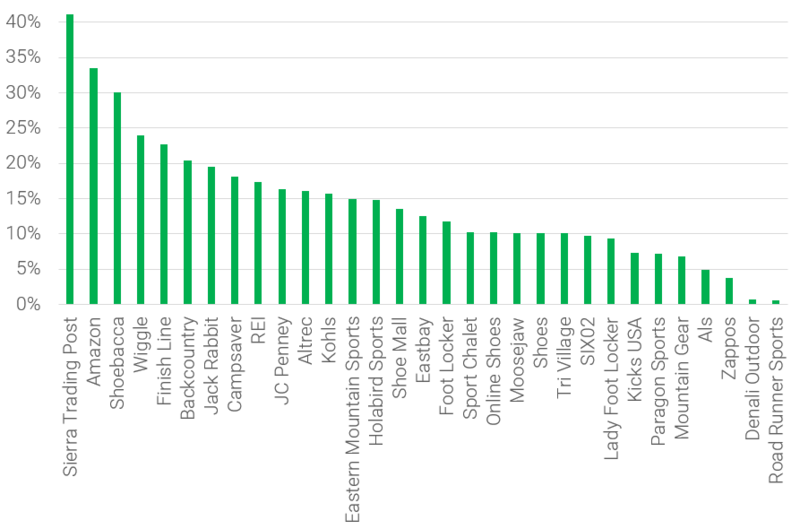 The average discount percentage is highest with Scott (62%), Reebok (53%) and Skechers (53%) while Vibram FiveFingers (15%) and Topo Athletic (15%) are least discounted. The 4 dominating brands (Nike, Brooks, Asics and Adidas) are discounted from 31-40% on average buy buying them online. It's surprising that brands are known for the cartel-alike price models in brick and mortar, but that they cannot control the prices online very well. Further, the 18 most popular brands are on average discounted 39.36%, which is a 25.99% higher average discount than the bottom 18 brands, which are discounted on average 31.24%. In terms of actual savings, Scott is number one again followed by Zoot and Mizuno. 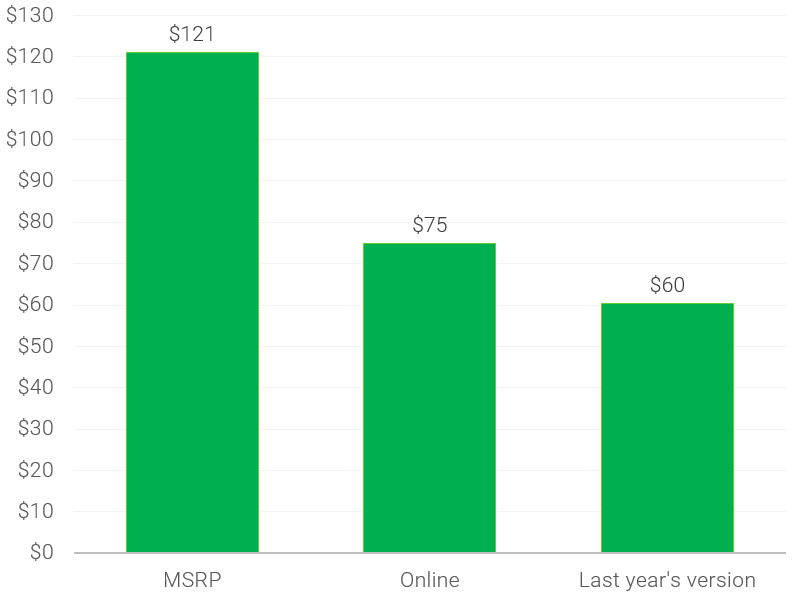 reveals a clear pattern that the broader the focus of the brand, the larger the savings online. Multi sport brands are on average found at a 37.50% discount, while the other two categories of brands are only discounted 32.64%, or equal to a 12.95% lower average discount saving. What type of running shoes are most affordable online? Trail running shoes are on average 6.6% ($4.8) more expensive than road running shoes. The discounts are on average equal for both categories. The more pronation control you request in your running shoes, the more expensive it becomes. Motion control running shoes are 13.68% ($10.08) more expensive than stability running shoes, 10.86% ($8.21) more expensive than neutral running shoes and 24.89% ($16.70) more expensive than minimalist running shoes. The biggest savings are on average found in stability running shoes, where you can expect to save an average of 42% ($53.66) online. The other categories are available at discounts around 37-39% ($43-$54). On average running shoes for competition purposes are 17.01% ($13.22) cheaper than running shoes for everyday training. 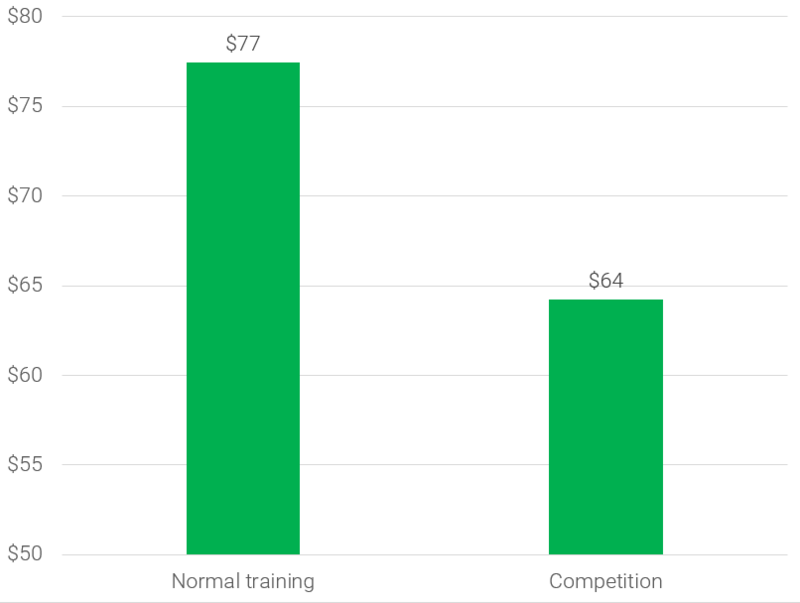 The savings by buying online are 16.15% higher on competition running shoes compared to running shoes for normal training. As expected, waterproof running shoes are more expensive ($3.96) than non-waterproof running shoes. This comparison is unfair since it the real comparison should be to compare running shoes that are available both as waterproof and as non-waterproof. In that case, one can expect that waterproof running shoes most often costs another $10. 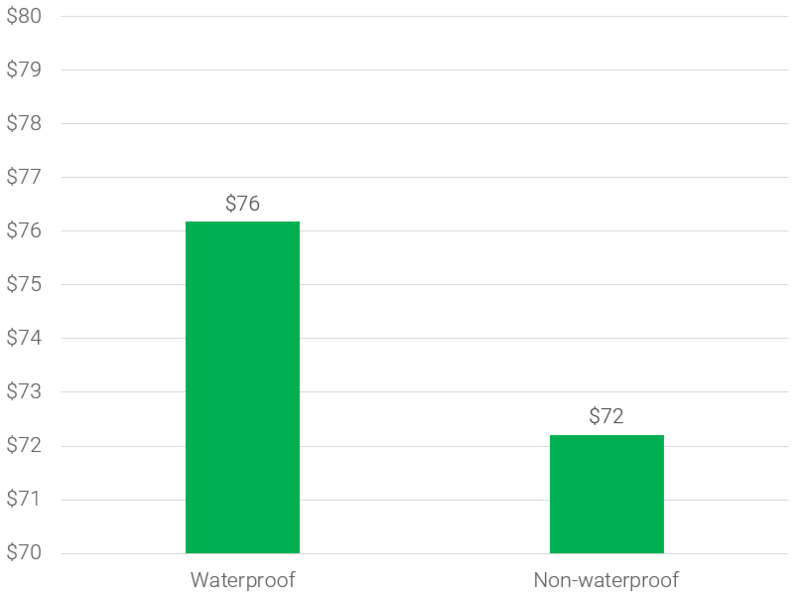 There are cases where the added waterproof feature will cost you another $15 or $20. Triathlon specific running shoes are cheaper ($2.49) than non-triathlon running shoes. We have previously illustrated that cheap running shoes get better reviews. Now we look at the discounts for different rated shoes. Based on more than 130,000 user ratings, there is a clear pattern than disliked running shoes are more discounted than well-liked ones. The rating scale goes from 1 to 5 with intervals of 0.1. It starts at 3.7 of 5, and for every 0.5 better user rating, the shoe will be discounted around 5% less. Running shoes with a user rating above 4.8 are discounted around 26% while running shoes with a user rating below 3.9 are discounted around 45%. The r2 is decent, though not impressive. Several times a year each brand launches new models. Some are successful others fail. The disliked running shoes are rarely continued, and runners rarely come back to buy the same model again. For that reason, retailers can't get the running shoes sold at list price and must reduce the price. On the other hand, retailers do not need to reduce prices of successful running shoes since happy runners will come back for more. Here you will find our ranking page of the best running shoes voted by runners and experts. On average the MSRP is increasing by $5.60 for every ounce (28.35 gram) heavier the running shoe is. The biggest savings are found on heavy running shoes. 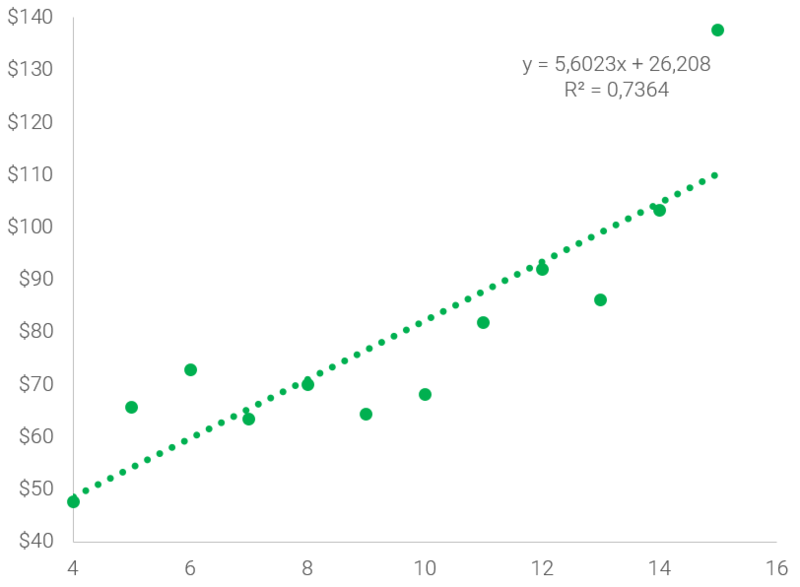 The r2 for the linear regression is 0,7364. 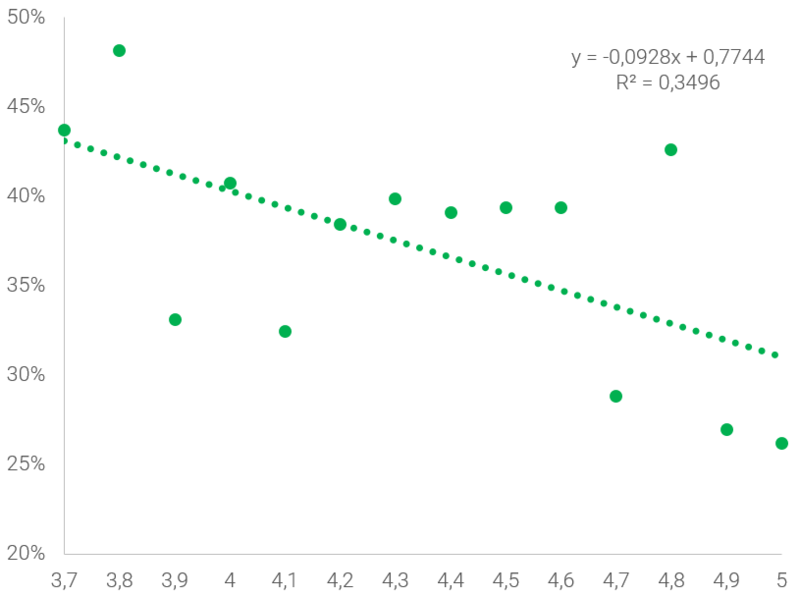 A higher r2 was found using an exponential correlation (0,85), though the understanding of the correlation is easier understood with a linear regression, which is the argument for choosing that. For the geeks the exponential equation is 40,387e^0,0674x. Further, heavy running shoes are more discounted. The percentage saving increases by an additional 1.23% for every ounce heavier the running shoe is. There is no difference in MSRP, sales price or discount percentage for running shoes with a different heel to toe drop. 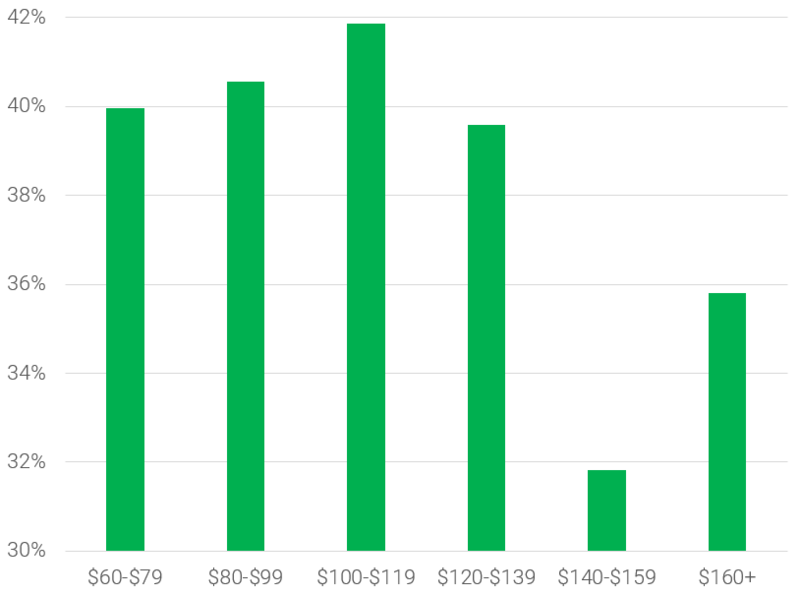 There seems to be a clear pattern that the most exclusive running shoes in the price range of $140+ are less discounted in percentage measurements than any of the other prices categories. They are on average discounted 31.81%-35.80% ($46.83-$62.35), while the other price categories of running shoes are discounted between 39.58%-41.86%. In absolute terms, you will save most buying premium running shoes, but in relative terms, the bargains are largest on none-premium running shoes. Where to find the best offers? Savings are great, but where do one find them? 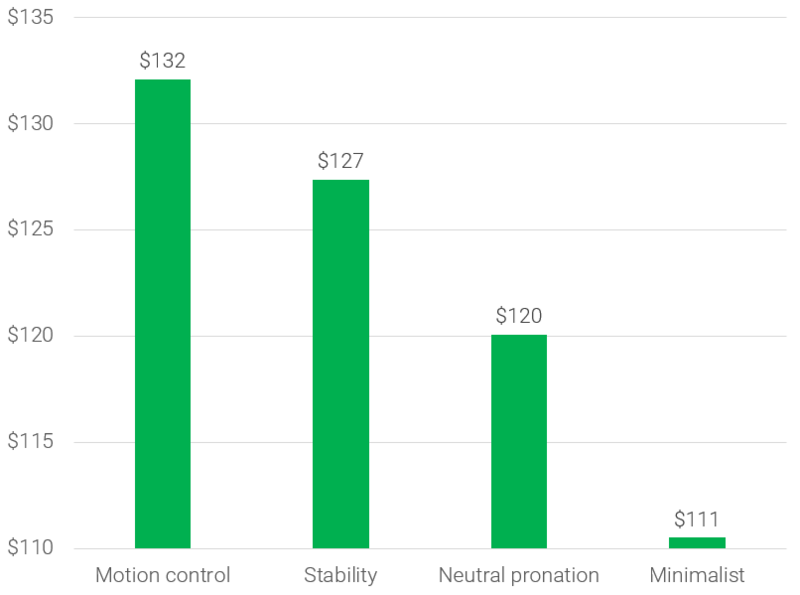 We analyzed prices from 46 online stores and compared their offers. In terms of average MSRP, Campsaver ($132.7) is carrying the most expensive running shoes. Second is Wiggle ($132.1) followed by Mountain Gear ($132.1). 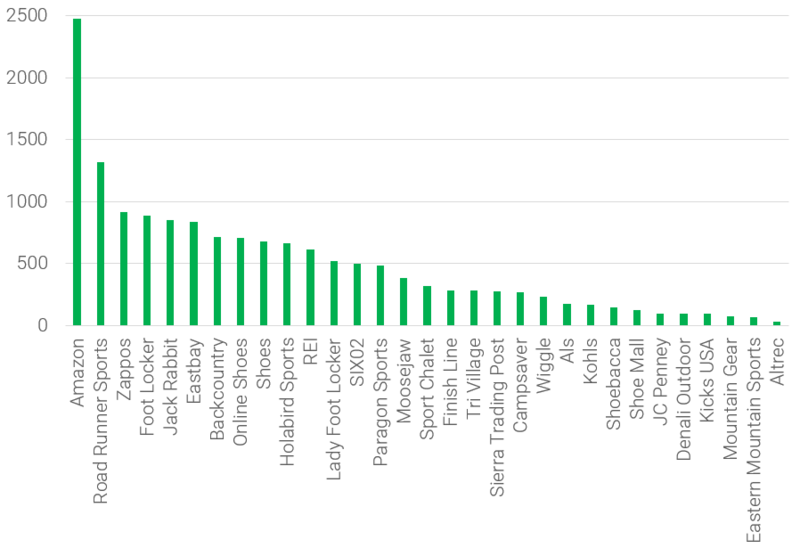 Carrying the cheapest running shoes on average is JC Penney ($80.7) followed by Kohls ($97.1). Where to find the largest savings? 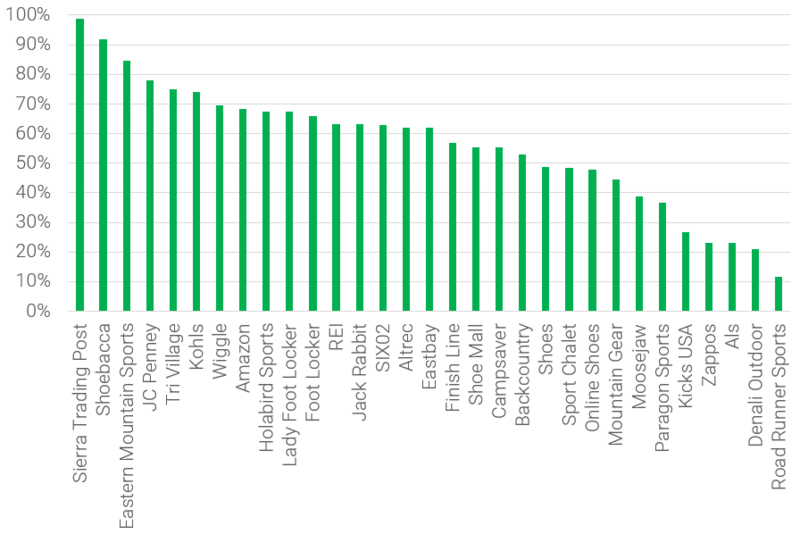 The largest savings are found at Sierra Trading Post with an average saving of 41% ($52.2), followed by Amazon with 34% ($40.1) and Shoebacca at 30% ($35.9). 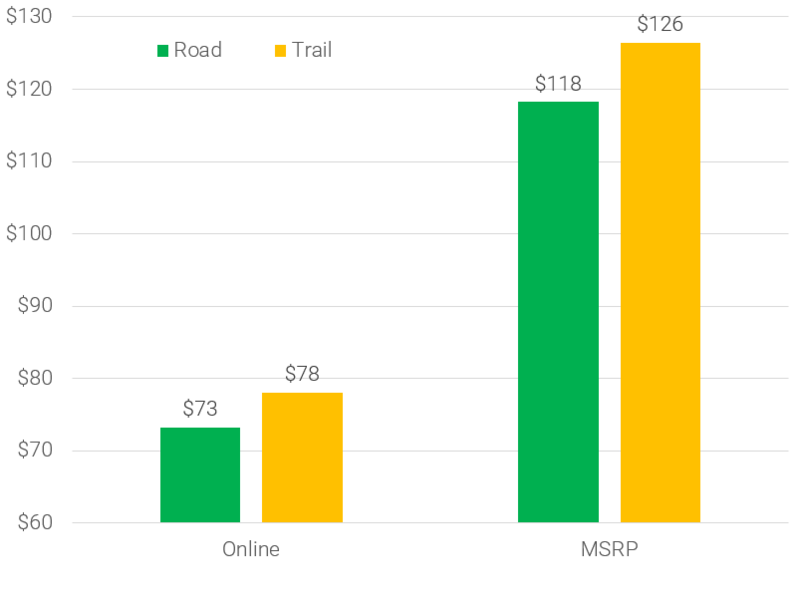 You will find the least discounts in Road Runner Sports with an average saving of 1% ($0.8), Denali Outdoor at 1% ($0.9) and Zappos at 4% ($4.6). Looking at a number of running shoes discounted the winner is Sierra Trading Post with 99% of all running shoes offered at a discounted price. 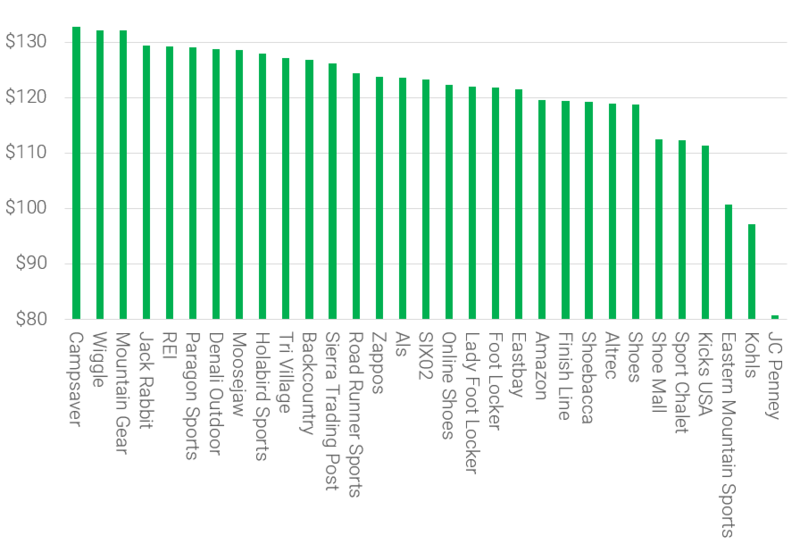 Next is Shoebacca at 92% followed by Eastern Mountain Sports at 85%. The store with the least offers is Road Runner Sports at 12% followed by Denali Outdoor at 21% and Als and Zappos at 23%. Amazon offers the greatest selection with 2479 different running shoes, followed by Road Runner Sports (1320) and Zappos (915). 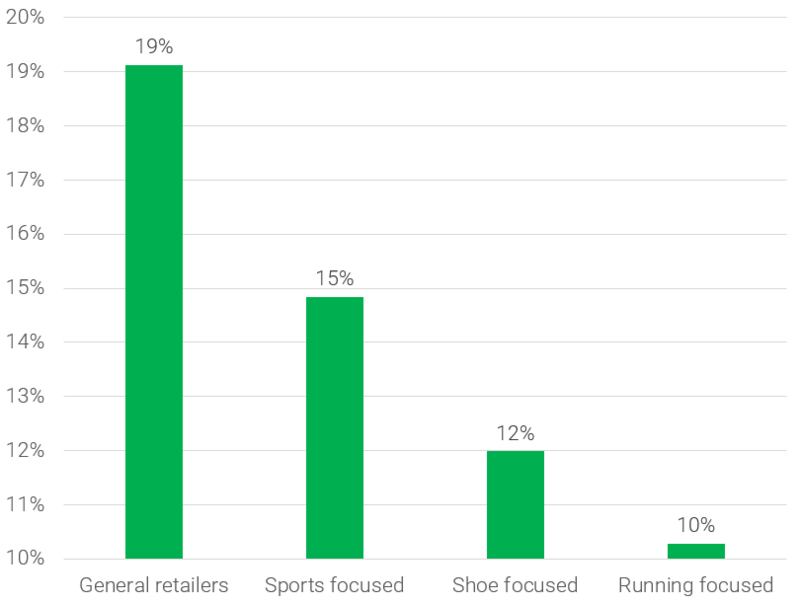 Categorizing all retailers into four categories: a) general retailers, b) sports focused, c) shoe focused and d) running specialist, one will see that the savings on average are higher the broader the focus of the store. General retailers offer an average saving of 19% followed by sports focused stores at 15%, then shoe focused stores at 12% and finally running specialists at 10%. 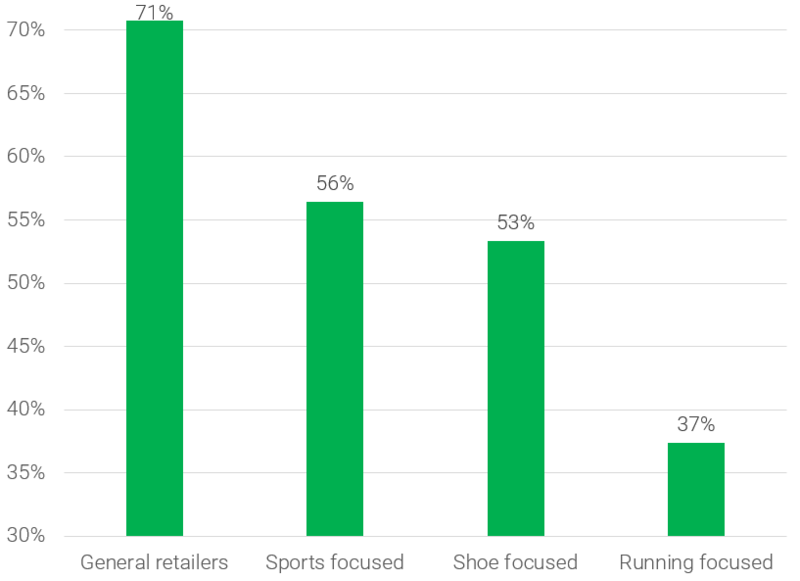 With the categorization it's clear that the general retailers have a higher proportion of their running shoes available at discounted prices (70.73%), sports-focused are at 56%, shoes focused are at 53% and finally running specialty stores at 37%. Discontinued shoes are not included in any calculation. Example: Nike LunarGlide 4, Nike LunarGlide 5 and Nike LunarGlide 6 are not included since the most recent version is Nike LunarGlide 7. There is one exception; the case where we compare prices for recent versions (e.g. Nike LunarGlide 7) with last years versions (Nike LunarGlide 6). The brand section omits brands with less than 5 current shoe versions at RunRepeat.com. Also, we have omitted brands that are only sold at 1 retailer. Excluded brands are: Haglöfs, Salming, Ecco, Helly Hansen, Icebug, Dynafit, Spira, Vivobarefoot, and Scarpa. All retail prices are collected through data feeds. A few retailers do not include all their running shoes, most often due to technical errors. Most often the greatest offers are only available in few sizes. This number crunching has not set any criteria for a minimum number of sizes available on a given shoe. We include 41 of the largest US retailers, though obviously more than 41 online stores sell running shoes, but we're confident that we have covered the vast majority of stores and sales online. We assume that current versions are sold at MSRP in brick and mortar stores. There are exceptions to the rule. Conclusions do not include thoughts on correlation vs causation. For instance, we conclude that triathlon running shoes are cheaper than non-triathlon running shoes. While this is true, it might not be the fact that the running shoe is for triathlon that makes it cheap (causation). Triathlon running shoes are known to be built for competition purposes. This means they are generally lighter than the average running shoe. We previously found that light running shoes are cheaper, which might be the real reason that triathlon running shoes are cheaper than non-triathlon running shoes. Keep this in mind while reading the results. 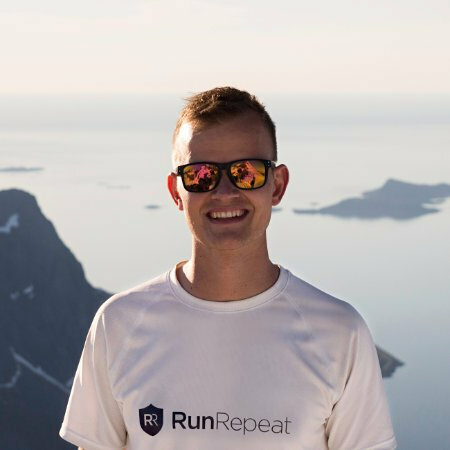 My name is Jens Jakob Andersen, and I'm the founder of RunRepeat.com. Besides being a former competitive runner, I have a background teaching statistics at Copenhagen Business School. A few other RunRepeat.com team members helped do this massive analysis including the Polish statistician Wojciech Fedyszyn. Feel free to use any content and graphics as long as you refer to this original source. For interviews, please reach out at jens@runrepeat.com or +45 29 29 29 58. You can download the full infographic here, and all graphics presented at this page separate here in a zip folder.